Arrive in Virginia Beach and check into Holiday Inn Express. Freshen up then depart for Christmas Town: A Busch Gardens Celebration, where guests will experience the park in a whole new light. More than a million twinkling lights in a complete Christmas Town experience that includes Santa's Workshop and the parks' 45-foot tall, light-animated Christmas tree. Enjoy dinner on own at Christmas Town before returning to the hotel. Enjoy breakfast at the hotel before meeting your Colonial Guide to begin your Holiday Decorations tour of Colonial Williamsburg. The tour includes the Capitol and the Governor's Palace. Enjoy an included lunch at a Colonial Tavern, before spending the afternoon exploring all that Colonial Williamsburg has to offer. Return to the hotel to freshen up before enjoying an included dinner at The Whaling Company followed by a visit to Newport News Celebration in Lights. Over 300 individual display pieces, rope lighting, and arches, that enhance the natural beauty of the two-miles drive along Newport News Park's main road. Enjoy breakfast at your hotel before departing for Jamestown Settlement Christmas that commemorates the first permanent English settlement in the New World. Featuring full-size replicas of the three ships that arrived in 1607, the reconstructed Jamestown Fort, costumed interpreters, and the Indian village and museum exhibits. Enjoy lunch on your own at the Settlement Cafe before departing for the American Revolution Museum at Yorktown. Enjoy a guided tour, telling the story of the nation's founding, from the twilight of the colonial period to the dawn of the Constitution and beyond. The Museum features interactive exhibits and films, outdoor living-history areas, and artillery demonstrations. Return to the hotel to freshen up before enjoying an included dinner at Rockafeller's Restaurant, Virginia Beach. Depart for hotel and drive on the Boardwalk through a Merry Mile of Holiday Lights. Enjoy breakfast at your hotel prior to checking out and departing for Mount Vernon the estate of George Washington. The Estate, fully decorated for Christmas, is one of America's most visited historic houses. Furnished in original pieces acquired by Washington himself. Mount Vernon, standing on the banks of the Potomac River, is both George Washington's home and final resting-place. Enjoy lunch on own at Mount Vernon before returning home. 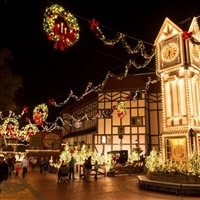 Deluxe Motorcoach Transportation, three nights accommodations, three breakfasts, one lunch, two dinners, admissions to Christmas Town: Busch Gardens, Colonial Williamsburg, Newport News Celebration in Lights, Jamestown Settlement, American Revolution Museum at Yorktown, Merry Mile of Holiday Lights, Mount Vernon Estate and guide service.